RCA or BNC. Standard configuration is RCA-to-RCA. Availability: High Speed Data is no longer available. 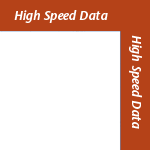 In July of 2014, High Speed Data was replaced by Parsec Digital.